Lately, Jesus has been reminding me of salvation deep in my guts. He speaks directly, kindly, lovingly, and with authority about what He has done and is doing in my life. I gave my heart to Him when I was six, wandered many years (those details are for another post), and then truly submitted myself to His rule in my life in college (more than a few years ago). With Thanksgiving approaching, it is only natural to deepen my thoughts of that for which I am thankful. 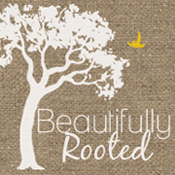 I hope you want to keep reading and will click on over to Beautifully Rooted. It is enjoyable to write posts about how much I love Jesus for a whole new audience, but I definitely want to share my thoughts with all of you! Thanks for checking it out and sharing your comment love. This Beautifully Rooted post showed up in my Blogger feed this morning. Before I clicked over to the actual blog, I read the first sentence- "Lately, Jesus has been reminding me of salvation deep in my guts." My first thought was "Angel must have another post up at BR!" Sure enough!! :) Love how deeply you feel stuff in your guts and in your heart! Thanks for sharing the foundations of our thanksgiving. Love you, friend! sent my thoughts on thankfulness a bit deeper today... i am SO excited about making this season of the year RICHER and DEEPER as a family. particular centered on a keen focus on Jesus, his cross, his mercy, his faithful challenging...getting to the root of our thanksgiving. :) thank you thank you thank you for this reminder! Your love to Jesus and complete surrender to his will inspires me a lot. Thank you for sharing this!